The Elpress product Railbond is designed to connect an earth wire or signal to a rail. 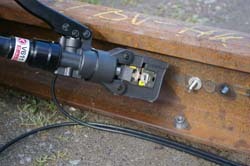 The connection provides a secure and reliable link for the contact between a terminal and rail for signal or earthing connection. The tested program, with references from several European countries and documented tests according to applicable standards, consists of a driller, grinding tool, terminal and crimping tool in addition to Railbond. The principle is simple. Drill a hole, install the Elpress Railbond unit and connect the terminal.